YouTube has become an integral tool for political campaigns across both national and local levels. And Google moderator has also been used in a variety of ways to host community town hall meetings. Today, Google is launching a 2010 Campaign Toolkit and an upgraded Google Campaign Toolkit. The toolkits aim to provide political candidates with the resources to successfully use both YouTube and other Google products to engage constituents and citizens. On YouTube, campaigns will have access to features like a Politician channel (which allows campaigns to brand their channel and upload longer videos), Google Moderator, and analytics tool YouTube Insight. The toolkit also includes paid advertising campaigns, such as in-stream ads and Promoted Video. The Google toolkit shows how products in the Google Apps family like Docs and Gmail, can keep staff and volunteers connected. The offerings are sure to be particularly useful for politicians and candidates who are running for office in the coming year. Long-winded politicians should love the fact that video time limits are longer than normal, and they can run the same 15-second and 30-second TV ad spots in YouTube. President Obama notably used YouTube for both his campaign efforts and now within the White House. 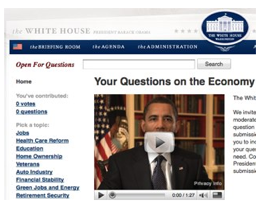 The White House also uses Google Moderator and App Engine.